Fit out that second treatment room. Many practitioners start off with one room fitted out and the other ready for when they get big enough. For $30,000 we can fit out a treatment room with cabinetry, flooring, painting, and some electrical fit off. I’m not an expert but I’m pretty sure you can buy an oral X-Ray for under $30,000 also (you can claim the asset write off on as many individual items as you wish). You could fully refurbish your reception and waiting area of the practice. This could include new reception counter, feature walls, feature lighting, flooring etc. Imagine how happy your staff and patients would be in a brand new reception area, all of which can be written off this year. April and May are very busy for us but at this stage we have a little bit of time in June, before the end of the financial year, when we could do some work for you. So please don’t hesitate to give me a call and let me know of your requirements. This is the owner of Commodore Dental & Medical Fitouts, Craig Exley, in his work gear, happily painting. We don’t see this everyday. But when this dental fitout project in Castle Hill absolutely and definitely had to be finished on time for a client to open, then Craig was there late into the evening in his work gear helping the painters. That is one of the differences about Commodore. It’s owned and run by Craig, utilising a team of very dedicated and proud tradespeople. We all care very much about the outcome for our clients, and all strive to have a great name for our company. Every project is important, and we aim for every client to become our next ‘word of mouth’ advertiser. So if you want to deal with the builder, not just the builder’s salesman or the latest project manager, then Commodore is the company for you. It doesn’t matter if you are a one chair start-up or a 2,000 square metre medical centre, we will deal with you personally and do everything in our power to get to the right workspace, at the right price, finished on time! 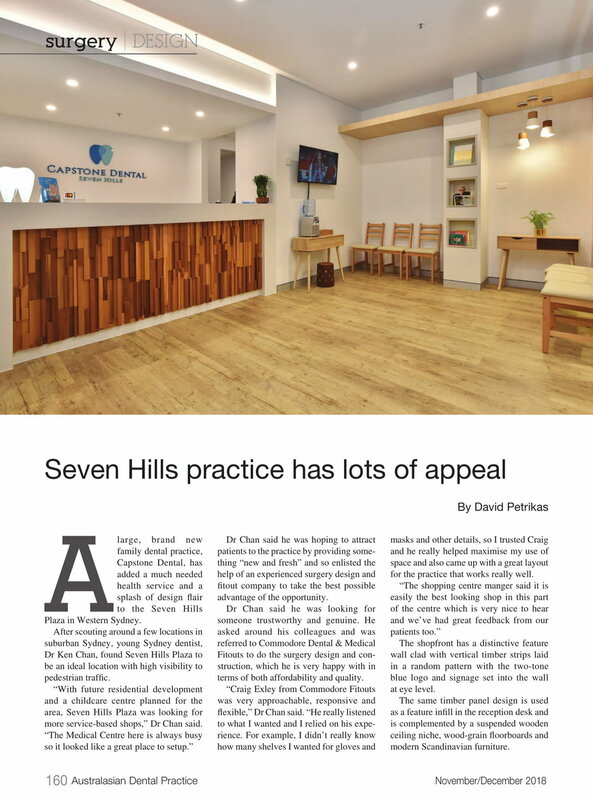 We recently completed a dental fitout for Dr Kenneth Chan of Capstone Dental in Seven Hills. Ken is a great dentist and a really nice man who we found to be a real pleasure to deal with. The fitout was featured in Australasian Dental Practice magazine. Here is the article. You can see more photos of Ken’s surgery along with our other fitouts on the Gallery page. A new dental or medical practice needs to be built well to support a profitable business in the long term. Sometimes exclusive fittings can deteriorate quickly and lead to refurbishment costs earlier than they could have been experienced. When you build and open a new practice it is common to start with one chair or treatment room and then open additional rooms or chairs as the patient base grows. Planning for the growth of your practice can save you significant money as it allows you to do the fitout in the most cost-effective way. There are a number of items that are much cheaper to install during the initial fitout rather than put them in later. Even though you are spending the money earlier, you will still save money in the longer run. IT is an area where good planning can save you significantly. Running cabling and conduits when you first build is very inexpensive compared to doing it later once the practice is up and running. Utilising grid ceilings in the treatment room areas also helps you grow later without expensive cost or repainting ceilings. Dental chairs and specialised dental joinery can be installed later with ease providing the provisions are in place ahead of time. Dental cabinetry is a significant expense in the fitout process. Good cabinetry is an investment that can possibly last your whole working life. Check for construction with water resistant plinths and modules. A dental specific cable management system should also be incorporated within the cabinets to allow for easy installation of IT and electrical services both now and in the future. Laminate finishes for doors and benchtops are cost effective and last many years without deteriorating. The modern selection of finishes is almost unlimited and includes high gloss, metallic, satin, woodgrain and many others. Your practice becomes an asset that can be sold in the future. Practices that are at full capacity will have less value than practices that have provisions in place for further growth and increased turnover. A nice new product we have come across for our dental and medical fitouts recently is switchable glass. It’s a product that used to be unaffordable in commercial premises but like many things has become less expensive in recent times. The glass contains liquid crystals which make it opaque. It is available in a range of shades. When the liquid crystals are powered with an electrical current they go clear making the glass transparent. It doesn’t actually go completely clear. There is a slight haze but it is still very impressive. In some models it is possible to have a ‘dimmer’ that adjusts the level of transparency of the glass. The glass can be connected to a normal switch or remote control so that the specialist can press a button to switch between clear and private in the consulting room. The switch glass can be ordered as full glass panels (higher quality) for about $2,000 per square metre, or as retrofit tinting (lower quality) that can be applied onto existing glass for about $1,000 per square metre. Also allow the cost of getting power to the glass. This varies depending on where they are, and obviously fixed panels are easier to get power to than doors. 1. Ceilings – I suggest using mostly acoustic grid ceilings in the hallway and dental or doctor’s treatment rooms, and a nice painted set ceiling in the reception and waiting area. This is a cost-effective compromise. 2. Choose the right equipment early – There are many choices for quality dental equipment in Sydney. We are familiar with most brands including Sirona, A-Dec, Belmont, Cattani and others and receive good feedback from our dentists on most of them. The surgery fitout needs to be set up for your specific dental equipment. The plumbing connections, mounts and electrical fittings all need to be installed in the right part of the treatment room or OPG room at the beginning of the fitout. 3. Flooring – Worth spending a little bit more for a high-quality floor in your surgery. Find a quality product that can be replaced in strips later if damaged. And check the slip rating. It should be R9 or R10. 4. Joinery – We have designed our custom dental and medical joinery using 30 years’ of experience. Always use a specialised dental or medical joinery provider to ensure quality and ergonomics in the treatment room. 5. Read the Scope of Works carefully – In most cases we have many many conversations about different ideas with our dentist, doctor or practice manager clients. All these ideas eventually get sifted and sorted and we end up with a Scope of Works for the project. You need to read it carefully to understand the final version of what’s in and what’s out. 6. Make sure your builder stays on schedule – Time is money. If your project runs late it will cost you money up front and also in the future. Make sure your dental fitout company sticks to the timeframe and help them to do so by being available and organised with your decisions and selection. Good luck with your exciting dental or medical fitout! We recently completed a nice medical centre fitout in Woy Woy, on the Central Coast. The premises are consulting rooms for neuroscience specialists. Please have a look in our gallery page for a few photos. I particularly like the colour scheme of this fitout. A special feature of the fitout was the external panelling that you can see in the photos. The panels are actually made of clad aluminium so the wood look will not fade or deteriorate. The panels provide good light as well as protection for the elements as well as shade when needed. I also like the artwork that the client has put in this fitout. I encourage our clients to spend a little bit of money of some quality artwork to really finish off their dental or medical fitout nicely. We have connections with a couple of galleries and photographers and can help with this if our clients would like us to. 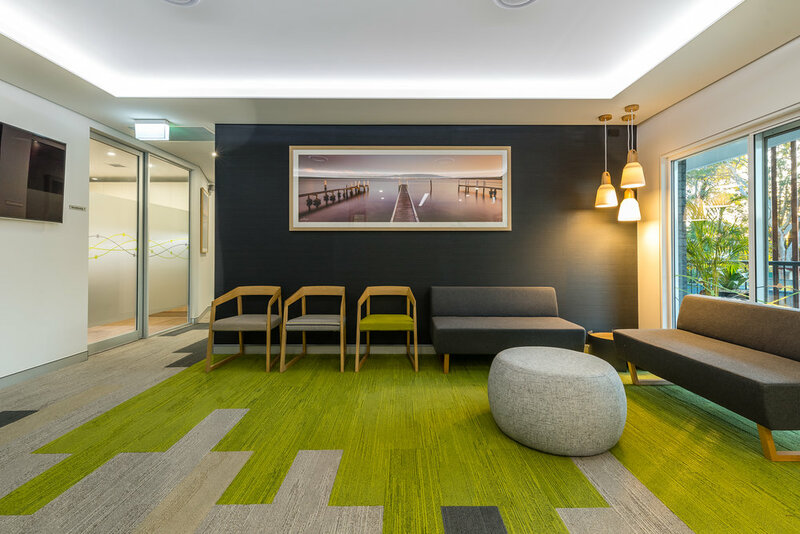 We recently completed a beautiful medical consulting rooms fitout for a Gastroenterologist in Bella Vista, in Northwest Sydney. The design inspiration was a joint effort between ourselves and the clients. High quality veneer panelling makes up a large part of the reception area back wall, concealing vast storage with top end hardware. The glass panelling throughout the fitout gives a great sense of light and transparency whilst maintaining privacy for the patients and health care professionals. In this medical fitout, we had to combine lots of design ideas into the space and also ensure we kept to the client’s budget. We finished on time and on budget and it’s one of our favourite fitouts this year. We noticed that the number of our female clients was growing. We wondered if it was just us or if there was a trend. So we looked into it to make sure our dental fitout company truly knew our clients and their needs. It turns out we were right. Upon surveying our complete database including past and present clients and all dentists that we have in our database over the last 10 years that the dental workforce has seen a huge increase in the number of women dentists. In 2008 women made up 39% of dentists within our client base. Today that number is 47%. And interestingly among dentists under 35, about 55% are female. We did some broader research and found that in Europe it is suggested that currently about 60% of dentists are women, with the top number being 74% in Finland. So we wondered why this is the case and what should we do to make sure our dental fitout design and construction company is making the most of this opportunity. Possible reasons include that fact that dentistry allows greater flexibility with working hours than many other professions. I also think that many patients just feel more relaxed being treated by a female dentist. For us I think it means we need to communicate clearly with our clients. Our female clients are often more in tune with the design process and provide excellent ideas in this area. If we can provide a good channel of communication during the design phase it will help us meet our client expectations. Male clients are less interested in the design we find. Of course we enjoy equally working with both male and female clients and will always strive to tailor our fitout designs and construction to best suit each client.